oh, I saw one more bottom tooth. That's 5 on the bottom? Wonder where the last one is? It's been a while due to the parents being in town, so here's a short recap of the stuff. The other day he played with a poodle in the park behind us, for 30-40 minutes. Since poodles can stand too, Mojo and the poodle stood at each other, among other things. Apparently the poodle humped Mojo, which caused great embarassment to the poodle's owner. Ela suggested getting a hump toy, which the woman said she'd look into. He saw a pug today, both at 7am and tonight at 8pm. The pug's name is Emma, and she's 2 years old, and the parents' name is Chris. Mojo & Emma didn't get to play much (it was on the way to pooping), It's funny how the sight of another dog will delay a poop. Emma did plop down and show Mojo her tummy, and Mojo did his play thing at her. Maybe when we're not busy they'll be able to play? Now that its warmer out, we've been meeting the dogs in the complex. There's a 15 year old terrier (seen last night and this afternoon), some small barky non-pomeranian (maybe a shi tzu), a Chiuaua, and a bunch of Lhasas. And a husky who's owners keep it on the porch. Plus there's a Hav back there in the complex behind us. And those are just the small dogs. Oh, the other day I was talking to Ela about what Hamlet's mom said (Hamlet = the great dane at puppy class). She said her old St. Bernard would carry eggs around w/o breaking them. I was wondering: would Mojo do that? I didn't want to try with a full egg, because it'd make a total mess. So I emptied an egg (poked holes in the ends, etc) and gave it to him. Would he crush it? Well he gently picked it up and carried it off. Whoo! The problem was we couldn't get it away from him without crushing the egg! He wouldn't drop it, and we didn't want to leave the egg alone with him just in case he did something like eat it. So we pried it out of his mouth, crunching it in the process. 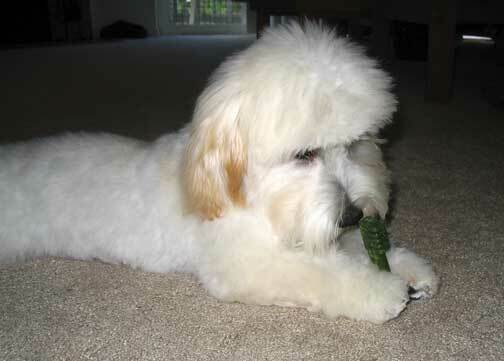 Right before our next trip to the groomer I'll try the egg thing again, with a real (full) egg, and see what happens. Tonight he ran around the golf course with Mom while the rest of us hit. That was fun for him - he ran all over the first tee, and they'd go back and forth. He finally got to see where we go all the time! Hmm. Today he pooped on the pad in the AM (after I left). Then he pooped on the carpet, because he ran out of pad space. Yuck. Ela cleaned that up, though. We think it's because we haven't really been around, and it was a "cry for attention." Who knows? He sure got attention today, including a bit of steak and a lot of salmon (we had extra salmon). That covers the hilights of the last few days. He still doesn't like hot weather, but the short hair really makes a difference. Oh, he brings us his leash if he wants to poop outside. How about that? Unfortunately, he also brings it when he just wants to go outside. Doh! Some more pictures. No writing today, been busy. Looking out the window again. Why can't I be outside all the time? Mojo in his less-than-graceful nap position. Just looked at Mojo's teeth, and the other two top teeth are coming in. Right now it's 6 on top and four on the bottom. The other two bottom teeth are expected soon. His hair really is very, very soft. It's as firm as short cat hair but much, much softer. Unreal. Maybe it'll grow out straight...which means we'll have a cat with an afro. But a soft afro. Mojo got groomed! The groomer said he was great! No complaining, and he fell asleep during his haircut. Unprecedented for a 5-month old dog. Maybe she says that about all the dogs? She said his head is kinda big relative to his body, so maybe his body'll grow in. He also said he was a pleasure to work with, and she'd love to have him back anytime. His body hair is down to maybe 1 or 1.5 cm, and is really soft - softer than cashmere. 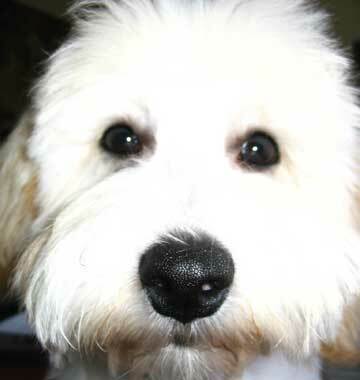 Maybe we should open a Havanese farm, shave 'em every summer, then sell the hair. Nothing was done to his tail, since it's still stringy. His head, well, you'll see. 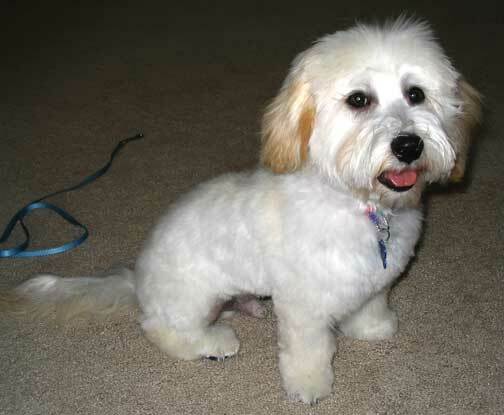 He actually looks bichon-like, or a bichon/poodle body cut? 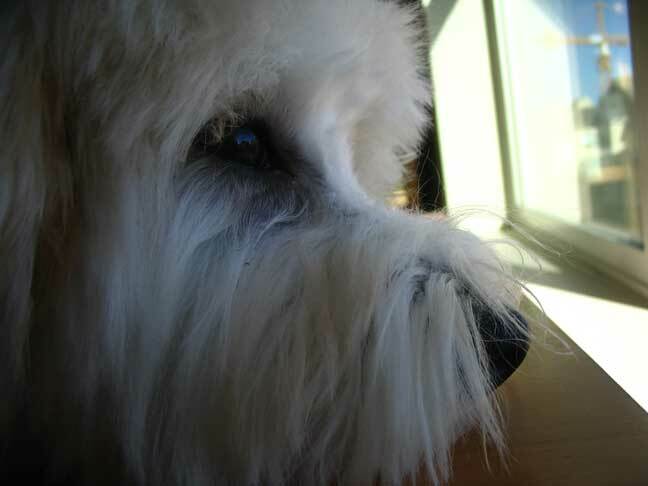 Thank goodness he doesn't look like a lhasa. He's got a bit of helmet head. It makes him look more studious as he concentrates on his greenie.